The 1 0z. 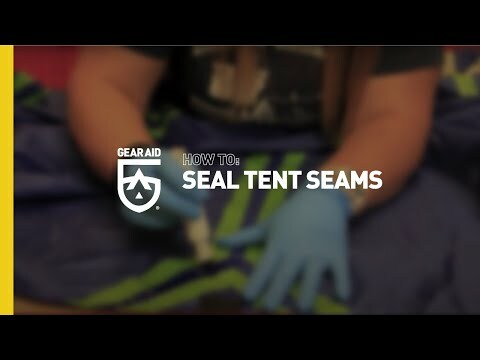 Gear Aid Seam Grip urethane repair adhesive permanently seals seams and leaks, repairs tears, and patches holes on tents, packs, sleeping pads and rain wear. Long considered the industry standard, Seam Grip was awarded the prestigious Editors' Choice Gold Award from Backpacker Magazine in 2002.Use Seam Grip to repair surfaces or seal seams of natural and synthetic fabrics, waterproof laminates, leather and vinyl. Seam Grip may be used to repair all types of waders and footwear, neoprene, PVC, rubber, and more. Concentrated and waterproof, Seam Grip offers excellent adhesion, long lasting flexibility, superior traction and abrasion resistance, with minimal shrinkage. When cured (dry) Seam Grip is a very thin, clear, elastic urethane rubber. Excellent Product. I re-fastened my older waterproof coat interior seam tape with this product. Make sure you clean and thoroughly dry the area to seal before you coat each surface. Let is dry for 5 minutes then stick the two surfaces together. You must use some clamping force to ensure it sticks well. I sandwiched the seam to seal with two outlet cover plates and clamped with binder clips overnight. I did small sections at a time. I even repaired a 2 inch section of zipper that became detached from the front of the coat. Again, clamping assures a good joint. Worked perfectly to close up a hook hole I had in my waders. It is nice that I can freeze the tube until I need it the next time. Great product, Fast shipment! Thank You! Took a brand new tent camping to Canada for 8 day trip. Sealed the tent and chalked it before we left. It worked amazing but don't like how it leaves a leftover look to it. It takes away from the look of the tent. I am very satisfied with the seam grip. Works great!